Here's a little experiment we played with lasts week. We stirred various things from the kitchen (turmeric, tea, coffee etc...) into water in bowls and then tried dying bits of wool with them. The main skills for this activity included fine motor skills in using a pair of (kids plastic) scissors to cut the wool, and descriptive skills - what did the various brews smell like, what colours were they, which strand of wool held onto the colour best, which was Ollie's favourite, and also a little about time, as we used a clock with five minutes marked on the face in drywipe pen to measure how long to leave the strands in the bowls. Both boys also liked having a little taste of each concoction before we added the wool in, although I reinforced the message withOllie not to taste anything unless he checks with me first. The tea and coffee were decaf and I made sure Ollie didn't choose anything too firey such as the chilli powder to make up a colour. 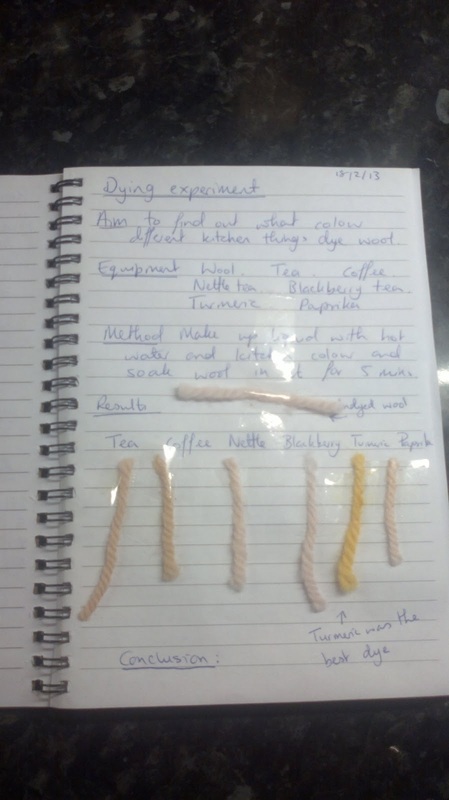 This could be another experiment that can be expanded on later, for example by trying out warm versus cold brews, adding a mordant such as salt etc... to see if the colours take better, and of course using different colourants. A seasonal theme could be added by mashing or blending non-poisonous leaves and berries from each season, maybe mud in winter, new nettle shoots in spring, strawberries in summer and blackberries in autumn.